Inderjeet Singh talks about mixing with the global student athlete community, competing while wearing borrowed shoes and winning silver at the Kazan Universiade. Inderjeet Singh’s silver medal in shot put at the recently concluded Universiade is India’s first podium finish in track-and-field events at the World University Games. It comes at a time when there is a renewed interest in the sport sparked by the release of a biopic on legendary Indian athlete Milkha Singh. The feat accomplished by Inderjeet Singh points towards promoting university sports which are essentially a stepping stone to an elite career. 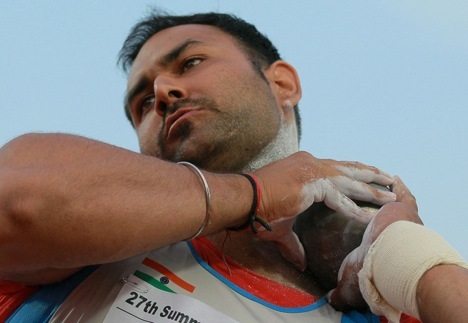 The shot put rounds were to commence within two days of Singh’s arrival, but before that he had to face an unexpected challenge. His luggage didn’t arrive with his connecting flight. He spent the day before the competition running hither and thither to arrange a replacement kit. “I got bandages from a medical centre, took wrist band from someone, but didn’t find shoes of my size,” Singh says. He had to squeeze into a pair which was one size smaller and of a different make than he was used to. It turned out to be a literally very tight competition for Singh as he scored his personal best of 19.70m, just 5cm ahead of the bronze position. After the finals, Singh had the time to experience the facilities at Russia’s modern student campus. “The accommodation was very nice and comfortable. The stadiums, gym, and other recreational areas were all top-class,” Singh says, while talking about the arrangements at the venue which hosted more than ten thousand athletes and delegates during the Universiade. This edition of the games also featured a series of cultural performances through dramas, films, music, and ballets. Several other fun activities kept the international participants entertained. “There were artists around the campus making portraits of participants. I had two made, one in water colours and another pencil sketch. I also got a temporary tattoo of the Universiade logo on my arm,” Singh recalls with excitement. Perhaps the only thing missing in the scheme was a vegetarian meal. “I had to rely on finger chips mostly and milk, fruits, and cornflakes for breakfast,” Singh complains. As per official statistics, over the period of the games about 620,000 meals were cooked, but none to suit a vegetarian. For Singh, the best part of the event was the opportunity to mingle with international student-athletes. There are other adornments he has brought from Kazan besides the silver medal. “There was a craze to exchange pins among the participants from all countries. I also traded a few with those from USA, Bangladesh, and some more,” he says. This impromptu ‘pins international exchange’ involved not just athletes but also delegates, volunteers, and media people who were on a spree to acquire as many pins from several countries and displaying them on the lanyard of their accreditation badges. It is in such spirit of friendship and sportsmanship that the Universiades are organized. And, the achievements of the likes of Inderjeet Singh motivate people back at their home to aspire more. The Association of Indian Universities (AIU), which represents the country at the Universiade, is now asking for more attention to its sports wing. “The university level games are the nurseries which produce world-class sportspersons,” Gurdeep Singh, a senior official of AIU, presents an apt analogy. “This is the beginning of the road to the Olympics,” he says. It is this very goal with which student athletes compete in the University Games, according to Inderjeet Singh, “We bid farewell to each other hoping to meet soon, perhaps at the next Olympics,” the silver medallist said.